A contractor was feared drowned after falling into the Port of Texas City, Texas, when scaffolding supporting him collapsed at the Marathon Petroleum Corp Galveston Bay refinery dock, a Texas City official said. "Divers are en route to do a body recovery," Derek Duckett, director of emergency management for Texas City, said on Monday. Part of the scaffolding fell at about 11:30 a.m. CDT (1630 GMT) Monday and the worker has not been seen since, Duckett said. "I heard part of the scaffolding fell and he was tied to it," Duckett said. Workers represented by the Building Trades Unions will return to Marathon Petroleum Corp's refinery in Catlettsburg, Kentucky on Monday, even as a strike by the United Steelworkers drags into a second week, documents obtained by Reuters show. The USW began a strike Feb. 1 at nine refineries and chemical plants, including Marathon's 240,000 barrel-a-day Kentucky plant. Buildings Trades Unions' workers will not be replacing striking workers' running the plant, according to the letter. Refiner Marathon Petroleum Corp said it would buy oil and natural gas company Hess Corp's retail and transport business for $2.87 billion, expanding its network of gas stations and convenience stores along the U.S. East Coast. While Hess has been shedding downstream assets to focus on more profitable shale drilling, the deal offers Marathon a buffer against the volatile refining business by boosting exposure to more stable cash flows from retail. It also provides a guaranteed market for the company's fuel, Marathon's Chief Executive Officer Gary Heminger said on a conference call on Thursday. Crowley Maritime Corporation christened the seventh of 10 new 185,000-barrel Articulated Tug-Barge (ATB) tank vessels that the company will take delivery of in 2010 and 2011. The vessels christened were the tug Pride and barge 650-7. 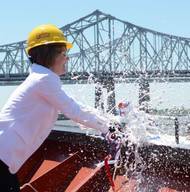 During the ceremonies, which took place at the Port of New Orleans, Cruise terminal #2, Susan Rodgers, Crowley senior vice president of corporate services christened the 10,728 Hp-tug Pride, while Rita McKain, wife of Bradley McKain, manager, terminal, transport and marine for Marathon Petroleum Company, christened the barge 650-7.